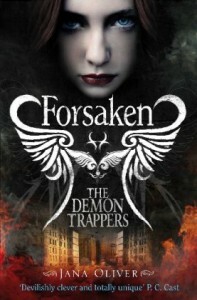 After the first chapter I was really skeptical, I mean… Capturing Demons by reading them to sleep? It just didn’t seem enough kickass.But I stuck with it and it got better, not only when it came to capturing demons but also the plot started to ensnare me more. I like a good fantasy book and while this started out slow, at some point I found myself engrossed. I also have to at that dystopian isn’t usually my thing, but here it worked.Oh, and when I say slow, I don’t even mean that nothing was happening because there was plenty happening. I just had a hard time connecting to the characters, for example Riley appeared very immature and almost naïve (she is only 17 and you will notice that) but she grows on you. She learns, albeit slowly but she does and that’s what counts most for me.There’s a nice variety of characters and I’m sure everyone will find a favorite as their personality are equally different and wide ranging. My favorites were without a doubt Simi and Beck.The tragic events at the beginning threw me a bit for a loop. I didn’t really know much about these characters and at that point didn’t care very much for Riley, so while I felt sympathy for her situation, I didn’t truly feel along with her like I do in so many other books.I realize now that the event was necessary, reading through all of it while not caring that much took away a lot from the book – almost made it boring for a while. The writing itself was solid and very descriptive in the POVs of Riley and Beck and at no point did I have trouble following the story despite the many plots and subplots.The many different plots might be a problem for some but I enjoyed them and puzzling over more than one mystery, trying to find a connection. But at the end you are still left with a lot of questions which made me jump right into book 2.